Icey Snowmen! 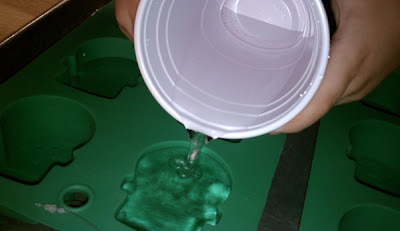 We took these snowman silicone cookie molds and filled them with water. 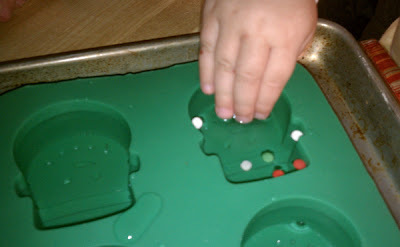 Then the kids threw in some Christmas sprinkles and mommy added some food coloring. Next we placed a long string, dipping a portion in each snowman to make ice garland and placed it outside overnight to freeze. If you recall last February we did something similar with our valentines. The Christmas sprinkles were a nice touch because they froze inside the snowmen and looked fun throughout the ice. I haven't had the chance to snap a pic of our final results, but we are going to hang the garland on our tree outside.